The University of Kentucky Wheat Science Group recently honored Kentucky producer Don Halcomb of Logan County with its first Service Award. The group created the award to recognize individuals for their partnerships with and contributions to wheat research in the UK College of Agriculture, Food and Environment. 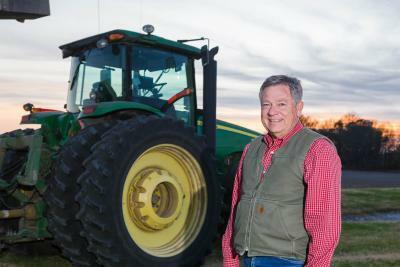 Halcomb of Schochoh has advocated for research that will improve Kentucky wheat operations and set the state up as a national leader in innovative wheat production. He has been a partner with UK’s Wheat Science Group since its formation and has been the driving force behind many UK research projects. Lloyd Murdock, UK extension soils scientist, has worked with Halcomb since the 1980s on numerous wheat-related research projects looking at effects of nitrogen on the crop. It was their work and leadership that helped no-till wheat become an accepted practice - first among Kentucky growers and later adopted by growers in other states. Halcomb, a graduate of Russellville High School, has partnered with group members on various research projects, including two decades of continuous wheat breeding and variety trials. He has also hosted many wheat and small grain field days in conjunction with college researchers. Halcomb believes the partnership between Kentucky wheat producers and the UK Wheat Science Group has been a win-win for all. “I feel like the wheat growers in Kentucky have made huge progress in the last 25 years, and UK researchers have been a big part of that,” he said.